Last week was the anniversary of the Halifax Explosion. 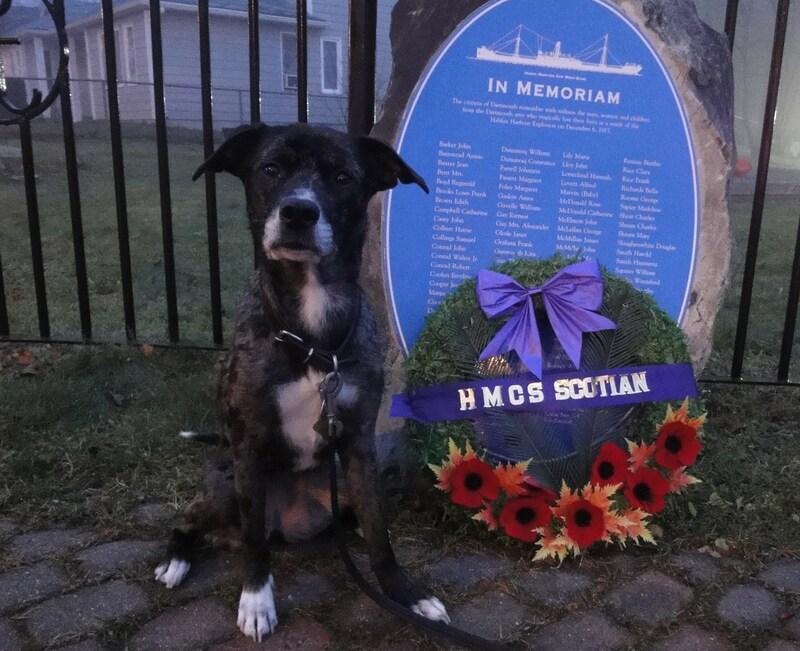 Since we live fairly close to one of the memorials, Shiva and I headed over to check out the pretty wreaths laid by the Canadian Naval Forces in honour of the tragic event. For those who don’t already know, the incident occurred during World War I on December 6th, 1917. Halifax is home to one of the country’s largest natural harbours and as such it became a vital base for supplies during the war. On that day, a French munitions ship collided in the middle of the harbour with a Norwegian vessel. The resulting explosion killed almost 2,000 people – many of whom were civilians – and decimated every structure within two square kilometres. Needless to say, the event is an important one to local history. It remains the world’s largest man-made accidental explosion. How’s that for a lesson of the day? I’m ashamed that I know so little of Canadian history…or geography. I’m glad that they commemorate the event each year. Thanks for the history lesson, now I’m taking your link to learn more about it. Like Jan, I am a little ashamed to say that I don’t know as much about Canadian history as I should, although I did take a class in college on Canadian history. Interesting about the Halifax explosion. I had not heard about it before. So I’ve been a little out of the loop lately. Gonna have to go back and read about this Red and Green Challenge thing! I wouldn’t worry about it! Many Canadians probably don’t know anything about it either. When I lived in Alberta I knew only the rough details, and that was just because I am kind of a history geek. Unless you live in the Maritimes, you probably wouldn’t know at all. I knew about that. Many had come down to watch the resulting fire from the collision. Shiva looks like she is taking the whole thing very seriously, and would be a bit annoyed with us if we didn’t as well. What a good girl, honoring those who died. That is a fascinating story and a beautiful picture of Shiva.